Work on the construction of the new helipad on the roof of the Bristol Royal Infirmary (BRI) has finished. The helipad will open in 2014 as part of a wider programme of work currently underway across the BRI by University Hospitals Bristol NHS Foundation Trust (UH Bristol), which incorporates a new ward block and Welcome Centre. Professor Jonathan Benger, consultant in emergency medicine at the BRI, said: “The helipad will enable patients to be transferred rapidly and efficiently to specialist services in our hospitals from throughout the South West and will increase their chance of survival and a good recovery. 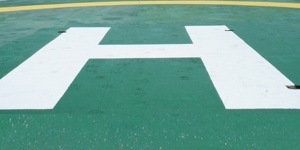 Deborah Lee, director of strategic development at UH Bristol, said: “We are delighted that the helipad has been built on time and in budget, and that it complies with Civil Aviation Authority design standards. The helipad will connect directly to the adult Emergency Department as well as to services within the Bristol Royal Hospital for Children. The Bristol Heart Institute will also receive patients transferred by helicopter for cardiac treatment. A grant of £500,000 has been provided by the HELP (Helicopter Emergency Landing Pads) Appeal to support the helipad’s construction.